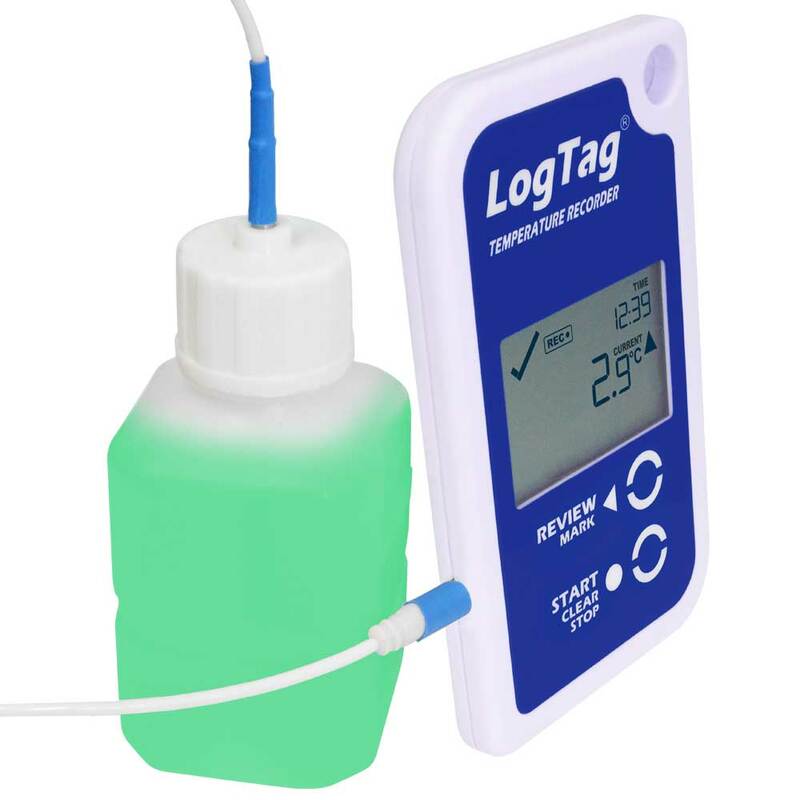 When placed in the refrigerator with vaccines, this set will accurately log their actual temperature, rather than the air temperature in the refrigerator. Also available without the USB Reader and Software. When a refrigerator door is opened, the air temperature in the refrigerator may rise quite rapidly, but the temperature of stored liquid vaccines will be much slower to react. Logging the temperature of a liquid will therefore give a much more accurate record of what your vaccines actually experienced. This set has a LogTag attached to a probe that is immersed in glycol. It mimics the actual temperature experienced by vaccines in your refrigerator. Note: The glycol (antifreeze) to go in the vial is not supplied but is readily available. External Sensor Measurement Range -40°C to +99°C (-40°F to +210°F). Rated Temperature Reading Accuracy Better than ±0.5°C (±0.9°F) for -20°C to +40°C (-4°F to +104°F), typically ±0.3°C (0.6°F). Better than ±0.8°C (±1.4°F) for -40°C to -20°C (-40°F to -4°F), typically ±0.5°C (0.9°F). Better than ±0.8°C (±1.4°F) for +40°C to +70°C (+104°F to +158°F), typically ±0.7°C (1.3°F). Better than ±1.2°C (±2.2°F) for +70°C to +99°C (+158°F to +210°F), typically ±1°C (1.8°F). Actual performance is typically much better than the rated values. Please see the Rated Absolute Accuracy chart below. Accuracy figures can be improved by recalibration. Rated Temperature Reading Resolution 0.1°C (0.2°F) for measurements -40°C to +50°C (-40°F to +122°F). 0.2°C (0.4°F) for measurements +50°C to +70°C (+122°F to +158°F). 0.3°C (0.5°F) for measurements +70°C to +80°C (+158°F to +176°F). 0.4°C-0.6°C (0.7°F to 1°F) for measurements +80°C to +99°C (+176°F to +210°F). Please see the Rated Native Resolution chart below. 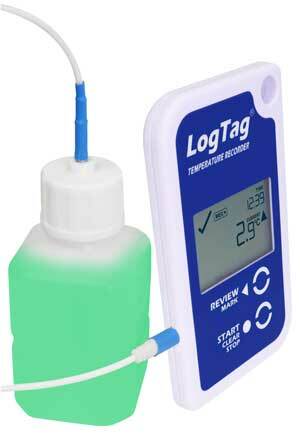 LogTag Analyzer® currently displays to one decimal place of °C or °F. 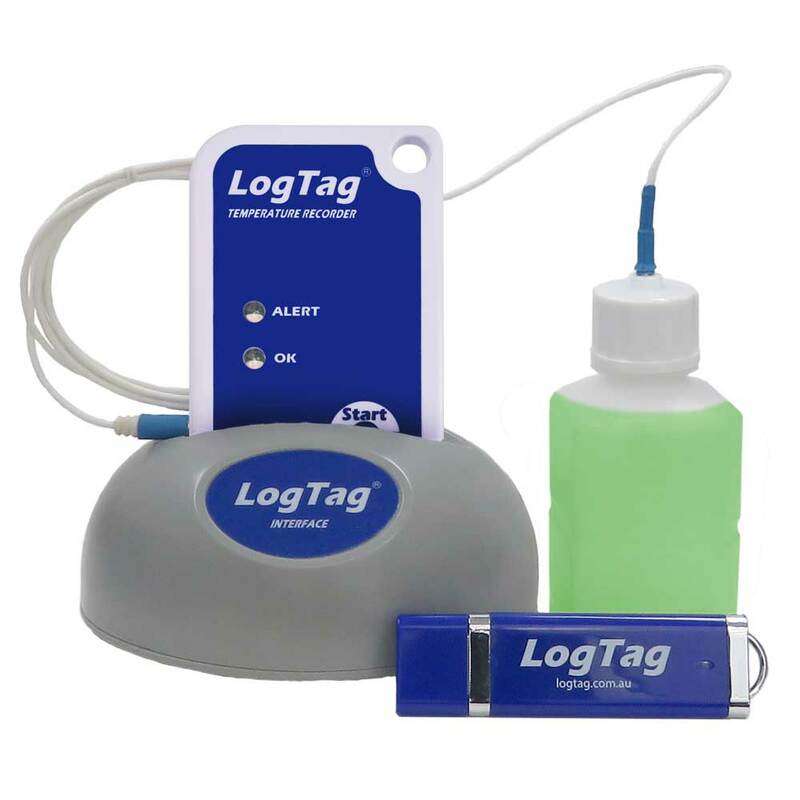 The native resolution is what is stored in the LogTag®. Sensor Reaction Time Typically less than 2 minutes (T90) in moving air (1m/s) for ST100T, ST100H and ST100S types. Recording Capacity 15,905 temperature readings. 66 days @ 6min logging. Day summary statistics memory (for display on LCD): up for 30 days of Max/Min/duration and alarm trigger statistics. Recording Indication State indicator “RECORDING”. Battery Life Typically 1 year of operation. NOTE: Typical battery life assumes 6 minute logging, day statistics are reviewed on the display no more than once daily for no longer than 30 seconds each time. Download data monthly. NOTE: Continual activation of the audible alarm will reduce the working life of the battery. When an alarm is triggered, the alarm should be cleared and reset as soon as possible. Standard Remote Sensor Cable Length Standard: 1.5m (4’11″). Extended: 3m (9’10″) (Recommended maximum). Storage Temperature Range -10°C to +55°C (14°F to +131°F). Rated Temperature Reading Accuracy Better than ±0.5°C for -10°C to +40°C. Better than ±0.7°C for -10°C to -30°C and +40°C to +60°C. Better than ±0.8°C for -30°C to -40°C and +60°C to +80°C. Better than ±1.0°C for +80°C to +99°C. Actual performance is typically much better than the rated values. Please see the Rated Absolute Accuracy chart below. Accuracy figures can be improved by recalibration. Rated Temperature Reading Resolution Less than 0.1°C for -40°C to +40°C. Less than 0.2°C for +40°C to +80°C. Less than 0.6°C for +80°C to +99°C. Please see the Rated Native Resolution chart below. 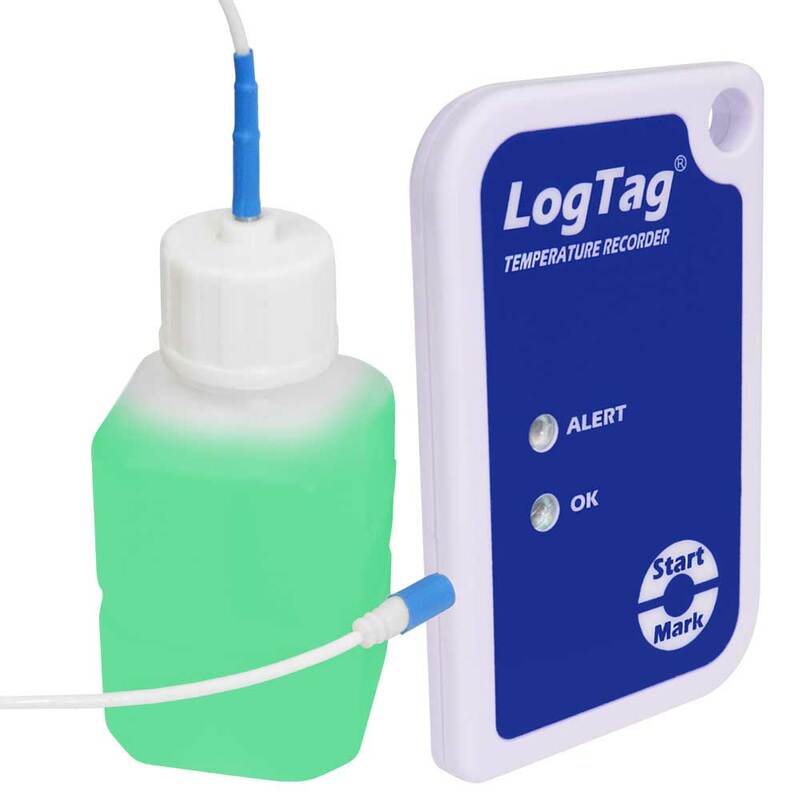 LogTag Analyzer® currently displays to one decimal place of °C or °F. 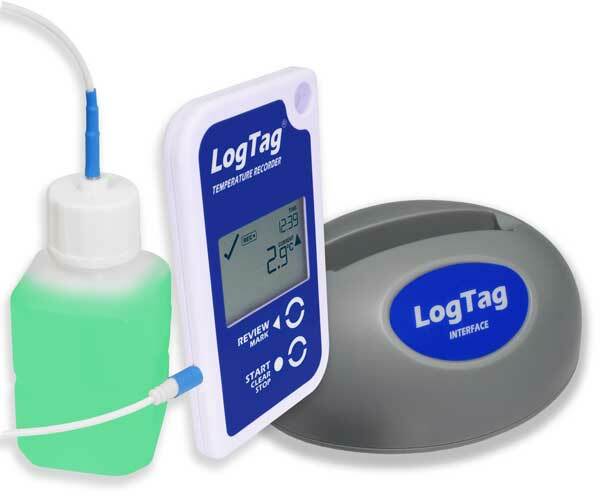 The native resolution is what is stored in the LogTag®. Recording Capacity 8031 temperature readings. 53 days @ 10min logging, 80 days @ 15min logging. Download Time Typically less than 5 seconds for full memory (8031 readings), depending on computer or readout device used. Weight 36g (without External Probe).